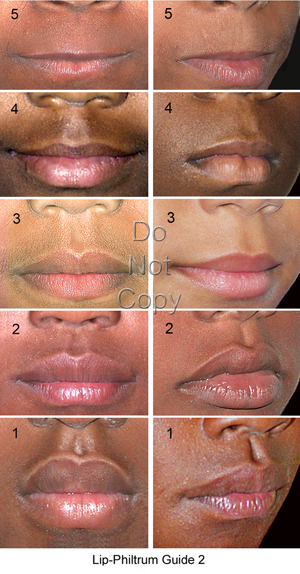 The Lip-Philtrum Guides (2004) are 5-point pictorial guides (see images below) that are used by the FASD 4-Digit Code to accurately measure philtrum smoothness and upper lip thinness. The performance of 4-Digit Code Lip-Philtrum Guides have been extensively assessed and validated. Only Lip-Philtrum Guides distributed by the University of Washington should be used with the University of Washington FASD 4-Digit Diagnostic Code. The Rank 5 picture portrays a philtrum that is completely smooth and an upper lip that is very thin (characteristic of FAS). The philtrum is the vertical groove between the nose and upper lip. The Rank 1 picture portrays a deeply grooved philtrum and very thick upper lip. As you advance up the Guide from Rank #1 to #5, the upper lip becomes thinner and the philtrum becomes smoother. (< 2.5th percentile and > 97.5th percentile). The Lip-Philtrum Guides are intended for use by medical professionals. Lip-Philtrum Guide 1 is used for Caucasians and all races (or combinations of races) with lips like Caucasians. Lip-Philtrum Guide 2 is used for African Americans and all races (or combinations of races) with thicker lips like African Americans. The medical doctor should select the Guide that best matches the phenotype of the patient's race(s). The digital image format is to be used on a smartphone or computer tablet. These images are available free of charge and can be obtained by contacting Susan Astley, PhD. The laminated format has the 4-Digit Code face and height-weight tables printed on the backside. There is a charge for the laminated guides. They can be ordered using our Order Form. The Digital Image Format of Lip-Philtrum Guides 1 and 2. The digital image format of Lip-Philtrum Guides 1 and 2 are displayed below. They come with a frontal and 3/4 view of the lips and philtrums. The 3/4 view images help to further portray the distinctions beween the 5 philtrum ranks. 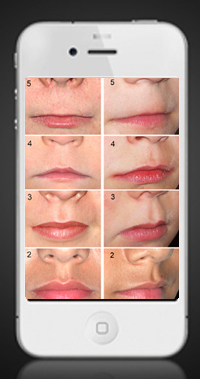 The frontal photos are used to rank lip thinness. The frontal and 3/4 view photos are used to rank philtrum smoothness. 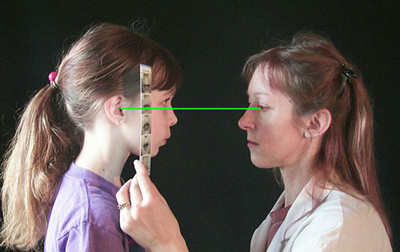 These digital images are intended to be loaded on a smartphone or computer tablet; devices that are small enough to hold next to the patient's face when you measure their features. Please do not print these digital images. Printing will invalidate the digital Lip-Philtrum Guides. If you print the digital guides, we cannot assure your printer will provide the required image quality to ensure the tool's validity. For example, there are very subtle differences between the Rank 4 and Rank 5 philtrums. Not all printers will capture this subtle difference. The images are also invalidated if the height-to-length ratio of the Guide is altered. The square printed on the digital guide helps ensure the height-to-length ratio of the Guide is correct. If the square looks retangular in shape, the aspect ratio of the Guide has been altered rendering the guide invalid. The Laminated Format of Lip-Philtrum Guides 1 and 2. The laminated Guides are 8.5 inches by 4.5 inches in size and are held next to the patient's face to measure the philtrum and lip. On the back side of each guide are the face and height-weight tables from the FASD4-Digit Diagnostic Guide (2004). All laminated Lip-Philtrum Guides distributed to date have been printed by the same Printer in Seattle to ensure the quality (and thus validity) of the Lip-Philtrum Guides. Physician using Lip-Philtrum Guide. Illustration of a physician aligned in the patient's frankfort horizontal plane while using the Lip-Philtrum Guide to rank upper lip thinness and philtrum smoothness. The frankfort horizontal plane is defined by a line (green line) that passes through the patient's external auditory canal and the lowest border of the bony orbital rim (orbitale). The physician's eyes (or camera lens) should be directly in line with this plane. If the physician stood above this plane looking down on the patient, the patient's upper lip could appear thinner than it truly is. Click here to see an animation demonstrating how to align yourself in the patient's frankfort horizontal plane. 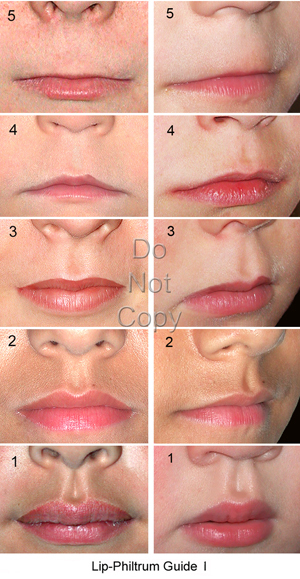 Copyright: Please do not use these Lip-Philtrum Guide images without written permission from Susan Astley, Ph.D.
Click here to view instructional photos for how to correctly identify and differentiate Rank 4 and Rank 5 philtrums. Lip-Philtrum Guide Tables printed on the backside of each Guide. 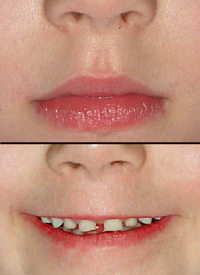 It is important that the patient have a relaxed facial expression (no smile, lips gently closed). A smile can alter lip thinness and philtrum smoothness. This is the same person with and without a smile. Note that without a smile, the lip and philtrum would both receive a correct Likert Rank of #2 on the Caucasian Lip-Philtrum Guide. With a smile, the lip and philtrum would both receive an incorrect Likert Rank of #5.